The Foundation Program (FP) is open to everyone. Through in-depth study and practise, it helps us close the gap between the inspiring teachings we hear at the Center and practising them in our daily life. We learn how to integrate all the meditation practises and wisdom advice from Buddha into our normal daily life. In this way we gradually find a deep inner peace and happiness in our lives. 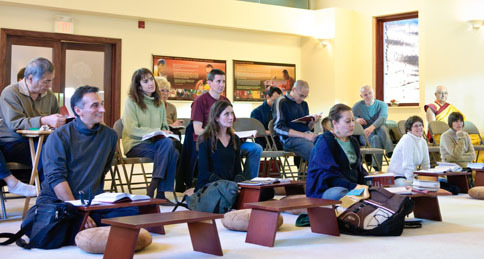 Foundation Program offers a structured approach to learning Buddhist meditation through the study of a particular book and classes consisting of guided meditations, teachings and discussion. By purchasing a $50 monthly card, this will cover all FP classes for the month, as well as night classes, lunchtime classes, Sunday classes and retreats. Alternatively you may pay $10 per class. Please contact us if you would like to hear more about Foundation Program and how to join. Also, feel free to drop in to a class to see if it is what you are looking for. 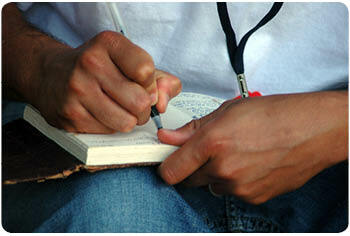 For those who cannot attend classes in person, it is possible to join the correspondence class with mp3 downloads. The foundation program is currently studying the book ‘The Joyful Path of Good Fortune’ by Venerable Geshe Kelsang Gyatso Rinpoche. This inspiring book offers us deep insights into the stages of the spiritual path known as Lamrim. 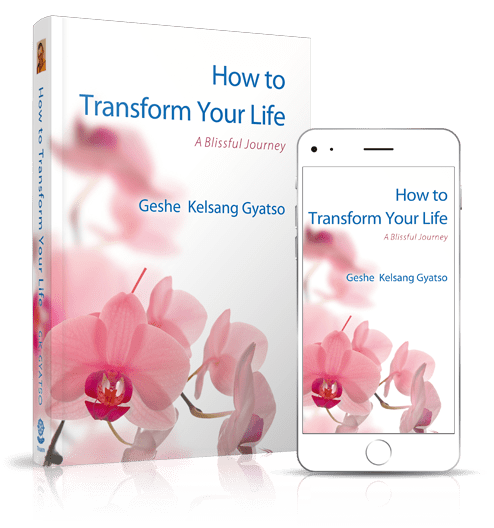 It shows how an understanding of the stages of the path can be used practically in everyday experience to significantly improve our inner peace, happiness and quality of life. A clear and precise presentation of the basic aspects of Mahayana Buddhism. The perfect basis for a strong daily practice. The support of a Spiritual Community. The transmission of the complete path to enlightenment in a way that is easy to understand and apply in daily life. Taught by Lamrim Centre’s Resident Teacher Kadam Joe Gauthier, this unique study program enables us to gain authentic experience of the Buddhadharma within the context of our regular lives. FIND OUT what Venerable Geshe Kelsang Gyatso has to say about the Foundation Program HERE.